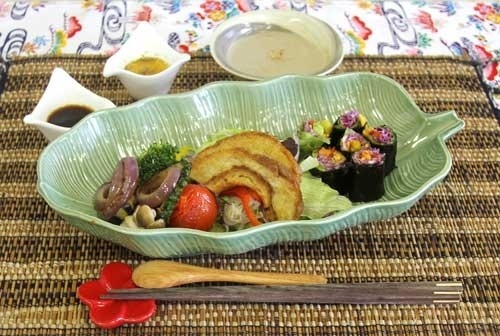 Frozen meal supplier Yosemiya's Muslim recipe, "Okinawa Genki Norimaki (seaweed roll) and Colorful Salad" was selected for the top prize in the vegetable section of the Muslim recipe contest. On January 29, Okinawa Prefectural Government and Okinawa Convention & Visitors Bureau (OCVB) held the final selection meeting for a Muslim recipe contest, created to attract visitors from Muslim countries, at Tiruru (Okinawa Gender Equality Center), Naha. The contest has two sections, the Vegetarian section, mainly using Okinawan vegetables, and the Non-Pork, Non-Alcohol section. Okinawa Genki Norimaki (seaweed roll) and Colorful Salad presented by Yosemiya, a frozen meal supplier, won the top prize in the Vegetarian section, and a full-course meal highlighting fresh Okinawan vegetables, presented by Kafuu Resort Fuchaku Condo Hotel, received the top prize in the Non-pork, Non-alcohol section.